View More In Pond Décor. - Dimensions: panel is 7.5" H x 6" W; weighs 2 lbs. This solar power floating water fountain kit will be a pleasant addition to any man-made pond. At 11 inches wide x 11 inches long x 2 inches tall this pump is large enough on its own or you can add another pond water fountain for a more dramatic feature. The floating water feature resembles a lotus flower so it adds beauty and charm to the outdoors. It is able to spray water up to 20 inches and can pump 48 gallons per hour. Simply place on the water's surface and let the power of the sun do the work! OVERALL DIMENSIONS: Small water fountain pump is 2 inches high x 11 inch diameter, weighs 2 pounds, making it an ideal size for your pond. Included solar panel is 6 inches wide x 7.5 inches high. CUSTOMIZING FEATURES: Submersible pump has a 16 foot cord so it can easily connect to the panel. The two spray heads give you the option to choose which water flow you would like to experience. POWERFUL PUMP: Fountain pump pushes/sprays water up to 20 inches high and pumps water at a rate of 48 gallons per hour. 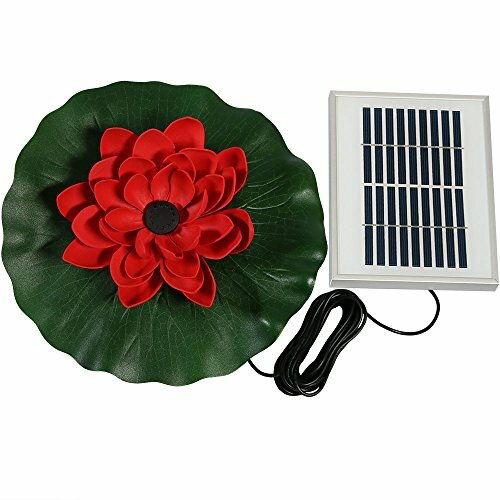 SOLAR ENERGY: Solar panel requires direct sunlight to operate, so you don't have to worry about plugging the hydroponics pump into an outlet or having it add to your electric bill.